I learned two simple rules from a very early age: (1) "Kids are to be seen, but not heard." and (2) "What I see or hear here, stays here." The adults in my life wanted me to be quiet and not repeat anything I'd heard. Sometimes the Church has the same approach when it comes to how to handle children in community. At the very least, this is a missed opportunity. I'm not saying kids MUST be present at all times. No time without the kids makes for both a bad marriage and bad church community. When dealing with serious sin or having conversations that young children aren't yet mature enough to handle, it's helpful to have some sort of childcare provided. But some churches use these reasons as an excuse to never have the kids around. By participating in community with adults, kids experience church life that doesn't revolve around them. To love and serve one another (particularly others who are different from us) is a learned behavior. Learning to love someone who is different is requires being with other people who are different. So, it's important to have older and younger people, singles and those who are married, rich and poor, and those who are culturally different together in community. When we exclude any group, everyone ends up weaker. Faith doesn't grow or flourish on it's own. When kids are present, adults are reminded what childlike faith looks like. As we get older and think we're wiser, our passion for our faith seems to diminish. We lose the wonder we once had. 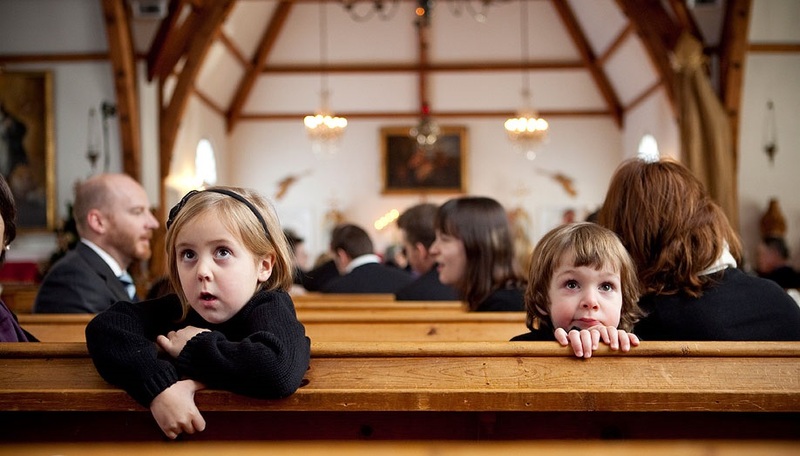 Kids still have the sense of dependence adult faith often lacks. As Christ said, "Truly I tell you, unless you change and become like little children, you will never enter the kingdom of heaven" (Matt. 18:3). As kids participate in the larger church community, we all mature. When a younger generation is around adults, the kids are reminded that their faith needs to be growing and maturing. Without older examples, their childlike faith can become childish faith. Worshiping together helps our kids develop the kind of faith that will hold up against the trials and temptations of adulthood. But kids aren't the only ones who mature when generations worship together. When adults learn how to communicate the things of faith to the children present in worship or their small group, they mature as well. This is what should drive our ministry endeavors. Our goal should be to "...present everyone mature in Christ. (Colossians 1:28). Adults and kids need each other. We can learn from one other. As this happens, our community will be stronger.